This coco brush head has a flat wooden head with natural coco fibre bristles. Suitable for ind..
Superior quality deck scrubbing brush. Hard wearing union mixture fill with good water retaini..
Coco Brush Handle 48" x 15/16"
Coco/Mop Handle 48" x 15/16". Fits the coco brush head and cotton mop head. &nb..
Coco Brush Handle 60" x 15/16"
Coco/Mop Handle 60" x 15/16" Fits the coco brush head and cotton mop head. .. This brush head has a flat wooden head with a bassine and cane bristle mixture. Requires a 1⅛" .. 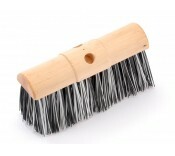 This black PVC brush head has a flat wooden head head with black PVC bristles. Suitable for ind.. This super bass brush head has a traditional saddleback wooden head with a stiff bassine and cane.. This heavy duty PVC scavenger brush head is a favourite with industrial contractors due to its st..
Bass Broom Handle 48" x 1⅛"
Bass Broom Handle 48" x 1⅛". Fits all bass brush heads. ..
Bass Broom Handle 60" x 1⅛"
Bass Broom Handle 60" x 1⅛" Fits all bass brush heads. ..
A metal fixing clamp that secures around the brush head and secures the brush handle to the brush.. Replacement tar bush head head for preparation and sealing. Suitable for application of viscous..
We have a great range of brush heads and handles that can be used for a wide variety of inductrial and domestic applications that will keep your brushes working for longer. Investing in brush heads and handles affords you and your business the luxury of being able to instantly replace broken brush fixtures, ensuring you’re never left wanting. At Manchester Safety Services we stock brush heads and handles in a range of different sizes, making it easier for you to find the correct fixture for your specific needs. Our brush heads are complete with durable and damage-resistant bristles to ensure that they retain their efficacy for longer. We stock brush heads with both coco fibre bristles and PVC bristles, allowing you to choose the brush head best suited to the job at hand. Many of our brush heads host connecting holes at various points on the spine, allowing customisable handle positioning. This can help those who require the brush to use in cramp or hard-to-reach places. Additionally, we stock the Round Bass Brush Clamp, giving extra customisability to the brush. This clamp can be simply fitted to a selection of brooms giving the user complete control over the positioning of the handle. If you require additional advice or help choosing the brush head and/or brush hand best suited to your needs, please call our dedicated sales team on 01706 364943. Alternatively, visit our extensive Trade Counter to view our ever-growing and evolving stock range.